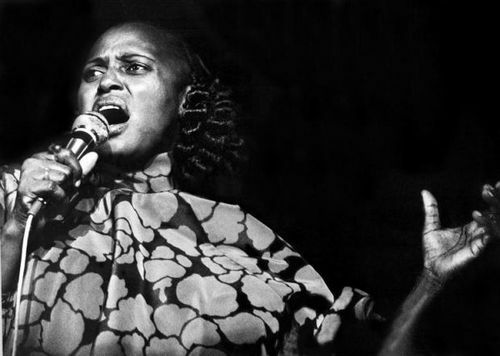 In Miriam Makeba’s native language, Xhosa, there’s a word, “ubuntu”, which translates as “I am because you are.” No one better embodied the spirit of “ubuntu” than Makeba, who died on Sunday from a heart attack. The iconic South African singer, known as “Mama Africa,” willingly endured personal sacrifice in order to speak out against the apartheid regime. She was forced to live in exile for more than thirty years. Her records were banned. Yet Makeba refused to back down, becoming a symbol of the struggle for equality. Makeba was the first African woman to win a Grammy award, taking home Best Folk Recording in 1966 for her collaboration with Harry Belafonte, “An Evening with Bellafonte/Makeba.” The album sought to raise awareness of the dire circumstances that black South Africans were living in. While Makeba’s career was often defined in opposition to the apartheid government that exiled her, Makeba always insisted that her goals were artistic, not political. Makeba wanted to bring South African music to the world, but also to bring the world’s music to South Africa. She was a cultural magpie, seamlessly interspersing the clicks of her native tongue and traditional melodies with Western influences, like jazz and folk. At a time when coverage of Africa seems confined to stories of chaos and strife, the loss of Makeba is a great one. She was a defiantly optimistic artist, who exported her homeland’s beauty and power while never forgetting its struggles. She may not have been a political artist, but she never stopped reminding the world that we all depend on each other. “I am because you are,” she sang.